Add a personal touch to your Presidential album with a coordinating spine patch. 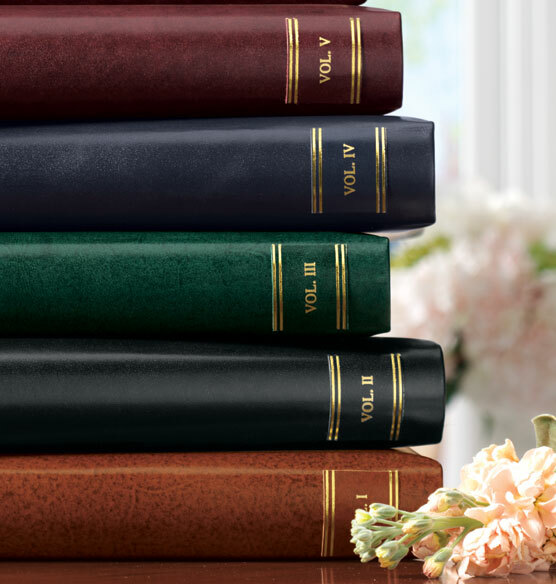 Blending seamlessly with this beautiful album, a Presidential extra capacity photo album spine label makes it easy to identify any album on the shelf. Personalize with up to 2 lines, 7 characters per line. The spine labels helped us finish organizing both new, and very olod photos in Exposures albums. We now can view our albums and find the ones we want. Our photo album shelves look lovely. Bought these a while back. They just look so shoddy, they ruined my entire album. The edges are obvious and they look like a cheap sticker. The patches I received were a much darker color than the album itself, and did not look good on the spine. This is only the case with the brown color; all the other patches seem to match their albums. 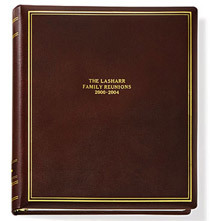 Perfect for family photo histories and I love that I can order them year after year, to match! Holds a year worth of photographs very well. 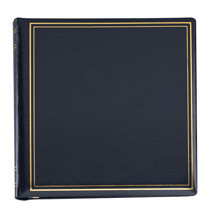 Is the Presidential Extra Capacity Photo Album Spine Label available in Navy? BEST ANSWER: Thank you for your question. Navy is no longer available. We hope this information will be of help to you. what size is this spine label? BEST ANSWER: Thank you for your question. The Extra Capacity is about 3"W x 1 1/4" H. We hope this information will be of help to you. It’s as wide as the spine- probably 1” x 2 “. It fits beautifully on the spine of the album. I need presidential extra capacity spine label in navy color with more than 7 letters per line. Can I do that? BEST ANSWER: Thank you for your question. Unfortunately no we are not able to add anymore lines to the personlization. We hope this information will be of help to you. is this a 3 ring album? BEST ANSWER: Thank you for your question. This is the spine label. You will need to look at the presidential albums. It can come in 3 ring or 4 ring. The item description will let you know. We hope this information will be of help to you. Will this label fit a standard Presidential album? BEST ANSWER: Thank you for your question. The Extra Capacity will be to wide for a standard album. We hope this information will be of help to you. Will this fit on the charter extra capacity? BEST ANSWER: Thank you for your question. Yes the spine patches will fit on the charter albums. We hope this information will be of help to you. WILL THIS SPINE LABEL FIT THE SHELBOURNE BOOK, SINCE YOU NO LONGER MAKE THEM? BEST ANSWER: Thank you for your question. Yes, it will fit the Shelbourne Album, not extra capacity though. We hope this information will be of help to you.